Take It Or Leave It: Happy new year! 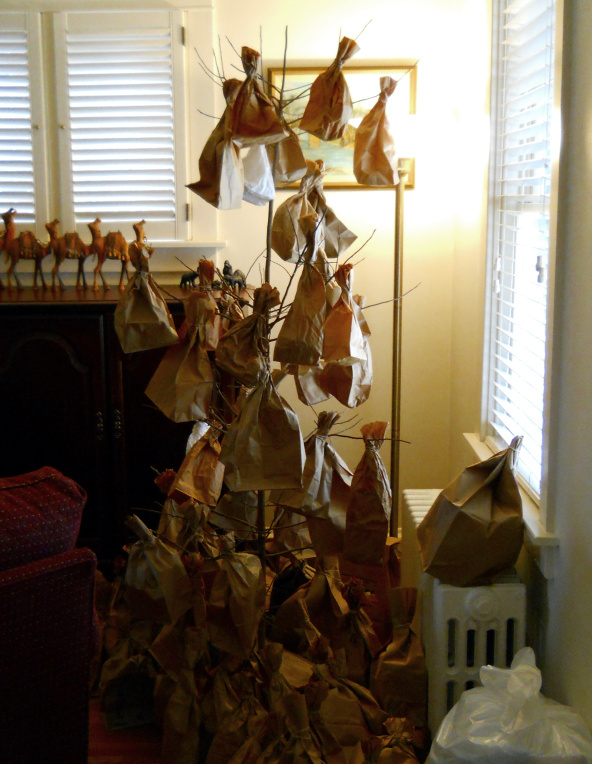 The Tree, fully loaded with bags. For the past 60 or so years, my family has had a rather peculiar tradition. Every New Years, after a delicious meal, we all gather around a dead tree to celebrate Take It Or Leave It. This dead tree has no leaves. It is just a spindly skeleton of branches and twigs. In place of leaves there are dozens of brown paper bags, each with a gift inside, secured to the limbs of the trees by rubber bands. Like at Christmas the contents of each are a mystery to all except the person who brought the gift. The tree is examined. Which limbs look bent under the weight of something heavy? Maybe the source of a bag can be identified by the style of rubber band used? At the very least, you hope to not forget which of the bags you brought. 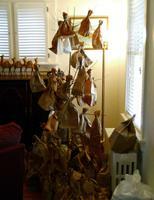 Each person takes one bag off the tree. You may look in the bag, but do not take the item out of the bag. At any time, you may trade bags with another person. If you take something out of a bag for any reason, you have to keep it. Continue going around the circle, taking bags off the tree until none are left. Here is how it typically plays out: There are eight to twelve people participating. Each person has brought somewhere between zero and a dozen items. One by one everyone takes turns, each removing a single bag from the tree. One by one, each person looks into their bags. Some smile, some groan, some look confused. A few dig furiously, trying to ascertain if the item holds a secret, but without taking off the bag and accidentally revealing what was inside. Maybe someone liked what they found. They remove the item from the bag, show it off to everyone and proclaim that they are keeping it. The person who brought it, happy to know their item has found a home, usually has a story to share regarding how they came into possession of such an oddity. The less pleased are looking to see who else is not satisfied with their findings in order to secure a trade. "This is not for me, but you'll love it!" they exclaim with varying degrees of sincerity. Take-it-or-leave-it is possibly the only time when the children are allowed (and encouraged) to act with duplicity towards their elders. The people who are carefully dismantling items within the bag are checking on the chance that a mundane item might actually be worth keeping. A few family members like to hide money inside otherwise trivial items. My grandfather would patiently unroll toilette paper, slip a two dollar bill between the sheets and with great precision re-roll it to be indistinguishable from the original. Those groaning know exactly what they are holding, not because they brought it but because they remember it from last year: one of several gag gifts that might go back more than a decade. Usually these are a combination of frivolous and distasteful. A particularly hideous lamp, a comical hat, a remarkable useless cake server styled to look like a high-heeled shoe. Take-it-or-leave-it fills an interesting niche for my family. A lot of the items are things that would normally be sold at a yard sale. A few items are superfluous spares, and the occasional re-gift. Some are intended for a specific person, perhaps because it arrived a day late or because you were not entirely sure they'd like it. The tree itself has been through several replacements over the decades. It has usually been cut from holly - a very sturdy and flexible wood that holds up well with age. Tree is optional though. If you don't have space to store an otherwise useless tree for the other 364 days, use something else. But we've always had a tree for the past three generations and it has become part of the tradition. Earlier I had mentioned that the items we bring are typical yard-sale fare. My extended family has never really done yard sales, maybe one every other decade when someone moves. Most of the items that would go to a yard sale end up being redistributed instead. Having run a few sales, bringing items to the Tree works a lot better. Don't have to set up early in the morning. Don't have to sit around all day. Don't have to figure out pricing. Don't have to do the whole 'sales' thing. 100% of items will be gone at the end of the day. Compared to a casual family-and-friends get together, yard sales are a whole lot of work and not all that enjoyable. I like it better than any other sort of gift swap. It is very non-confrontational and almost follows the German board game philosophy. Most other swaps force you to exchange items with other people, even if you don't want to. As an added bonus, there is no requirement to bring an item, nor is there a minimum/maximum value to worry about. And finally, it gives another excuse to have a good meal with family and friends. People who couldn't make it to other family get-togethers (either because of work, weather, geography or multiple families) can usually make it to a New Years Day get together and enjoy the regional New Year's dishes. [Bilbo] gave away presents to all and sundry - the latter were those who went out again by a back way and came in again by the gate. Hobbits give presents to other people on their own birthdays. Not very expensive ones, as a rule, and not so lavishly as on this occasion; but it was not a bad system. Overall, I would have to agree. It has not been a bad system in the least.